I was surprised to see him walk up and say “Hello!” He came to hear my talk at St. Elizabeth’s Catholic Church in New Jersey. My wife and I appreciate Fox News and find it much more informative, objective, balanced and fun than any of the other news outlets. We don’t have TV at home but watch Fox News at hotels and wherever we travel. 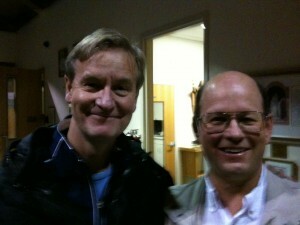 It was a big surprise to see Steve Doocy walk up and say Hello. He is one of the three hosts on the morning show Fox and Friends. I’ve heard Steve mention that he was Catholic on his show. Seems to be a nice guy on television. Good to see he’s serious about his faith. Previous post: Lovely Kind of E-mails!